London Marathon advice comes in all shapes and sizes. However, for the sake of this article, we are focusing on the novice marathon runner. So if you are running the 26.2 miles for the first time next April, here are a few useful bits of advice to consider. 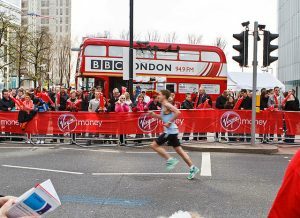 Running the London Marathon is the ultimate endurance event for many people. With this in mind, it pays to prepare well. Especially considering the hard miles of training you will need to endure. You will probably be getting yourself ready for the meat of your training as New Year approaches. As of today, the big day is just under 18 weeks away. This is the time to get serious. Provided you have done some base training, it is time to make a plan for the run-up to the London Marathon. You are about to set off on the most intense period of your training. Therefore, it is important to be confident in the equipment you have for the task at hand. Top of your list has to be your running shoes. Although you may have bought a decent pair when you initially started your training, you need to consider this. What will the condition of your shoes be like on the day of the Marathon?! If you are going to need a new pair before you do the run, it is best to buy them while your training load is still relatively small. And certainly, you do not want to be breaking in a new pair on the day of the run or close to it. You will be severely limited by blisters if you do! It is recommended that you replace your shoes approximately every 500 miles of running. You should be able to calculate how far you have gone so far if you have been keeping a training log. But the 500 miles is only a rule of thumb. Check the condition of your existing shoes. Press your thumb into the midsole of the shoe. It should be cushioned with some give. If it feels leathery and inflexible the shoes need renewing. Also, check the heel of the shoe. It should be even on both sides. If the heal has become worn down it will compromise the support and shock absorption. Don’t scrimp on running shoes. They are vital. Although it is ok to do some of the initial training on treadmills, you need to spend progressively more time running outside. So far, the winter has been relatively mild. But as we head into January and February, you need to find ways to keep as warm and dry as possible. Not being dressed appropriately for the conditions can dampen enthusiasm and cause you to cheat on your plan. One of the key pieces of advice we can give is layering. Wearing a few thin layers of clothing that you can add and subtract during the run will help you to regulate your body temperature. Try not to wear heavy or bulky t-shirts or sweatshirts. Crucially, you need base layers that keep the moisture away from your skin as you sweat. This is known as moisture-wicking. It will certainly make your running experience more pleasant. Good quality brands such as Decathlon have tops, shorts and socks all designed with moisture-wicking properties. Finally, when it comes to clothing there are a few other items to consider. Look to buy proper running gloves (they make it easier to tie up shoe laces that come undone). Also, buy some reflective strips or reflective clothing. You will be running in the dark, or certainly some gloomy conditions, and you need to be visible. And a good quality runner’s head torch is another useful piece of equipment. What we have listed above is some of the bare essentials. We’ll cover some other advice on some useful equipment in our next blog. In the meantime, if you need any further London Marathon advice or any tips for coping with niggling injuries, do contact us. We’ll be happy to help.